The diameter of the galaxy is ..? (10,000 or more light-years?). The diameter of the black hole is ..?, the diameter of the sun? How is the star immediately crossed 5,000 or more, light-years? How seen through the black hole 5,000 light years thick layer of matter? That's a warp signature of a starship. Look for a really big halo to see another quantum leap. Your comment is brilliant. You should totally publish those ideas. Now witness the destructive power of my fully operational battle station. Happy thanksgiving back to you, and to everyone else as well. Oh, and by the way, "You must build more pylons". Some people will get it. The diameter of the galaxy is ..? The diameter of the black hole is ..?, the diameter of the sun? If it were our galaxy, that would be difficult. Our Milky way is about 100.000 lightyears accross and indeed almost impossible to look towards the center. The jets however would be perpendicular towards the galactic plane and supposedly the light would be very visible. This however is in another galaxy and we might (I assume) be looking into the center rather than sideways. The BH would not be very large in size, but the enormous mass would accelerate the stars in close orbit to such high speeds you can infer the position of the BH from it. They -according to the article- found a huge amount of light coming from that position and succesfully ruled out it was a sucked in accretion disk and probably one star less. and to my fellow planetary citizens on the northern american continent: Happy thanksgiving. Wow, a huge Cosmic Urp. Ignorance is not a valid argument against the paper. Makes me glad we only have to worry about asteroid collisions and CME events. The diameter of the galaxy (from pole to pole) is up to 30,000 light-years. I suggested 10,000 light years. This probably implies if the discussion of the black hole. The diameter of the black hole is unknown but no larger than the diameter of the sun. Maybe there are more black holes, one at the poles? If one is did not warp, already teleportation. But is argument that the article is not respected. Referring to the, Upside down Theory: Protons and Electrons are derived through a process of a Singularity shredding the fabric of space into individual fields of point like energies creating matter and antimatter (W1). (W2) What we understand as matter is thrown off at the equator of the singularity, accumulating a cloud of electrons and protons in a disk like shape. Anything one would consider as antimatter is absorbed into the singularity in the form as mass. If this statement is true, than the singularity should have the same mass as the surrounding disk. (w3): A neutron acceptable for recycling. Thanks for not allowing W1, W2, W3, explanations! "An international team of astrophysicists led by a Johns Hopkins University scientist has for the first time witnessed a star being swallowed by a black hole and ejecting a flare of matter moving at nearly the speed of light." This claim is some how funny. Evidence when these "scientist" can not see actual object that can do such kind of things and can not understand its real nature because lack of ability for direct observations and experiments. Тhey attribute frivolous qualities to unobservable objects that fabricate evidence of their faforite theories. 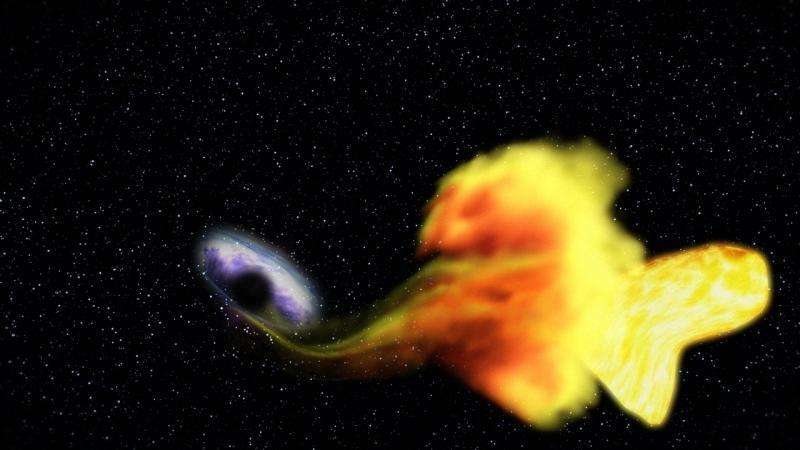 "A black hole devouring a star." This photo but an artistic interpretation. I think that people will fail in their desire to take the place of God from vain motives. "The Milky Way is a barred spiral galaxy that has a diameter usually considered to be about 100,000–120,000 light-years but may be 150,000–180,000 light-years." Thus this event was in another galaxy that is around 100X the diameter of our galaxy away, or 300 million light years away per the article. According to https://en.wikipe..._regions we can see light that is from a galaxy that is 30 billion light years away (even though the universe is only 13 billion years old due to expansion of the universe). So this even was relatively close to us considering the size of the universe, approximately within the closest 3% of the universe. This photo but an artistic interpretation. They failed to explain that in the caption. Not even the scale is mentioned. Sloppy. I do not agree. They observed this time evolving object in many wavelengths. More wavelengths than you can "directly" see with your eyes. Anyway, lack of observation and facts never stop _you_ from making assertions. By what twist of mind does observing this object and then trying to understand it amount to a "desire to take the place of God from vain motives" ? What do you hope to achieve with these fabricated accusations against honest hardworking scientists, prophet status ? Make no mistake. Discovery is excellent. The problem begins with an explanation. Instead of black holes place the cyclone and all agrees, there is no ambiguities. Phys1 is identical to my2cts, by the way. Well, is this an example of a cosmic magnetron using magnetics to spin up matter to mass? I have proposed that a bh is but light mazed.